William D. Adams, chairman of the National Endowment for the Humanities, will be the featured speaker at Lafayette’s 181st Commencement Saturday, May 21. The College will present him and three other distinguished individuals with honorary degrees. Adams will be awarded an honorary Doctor of Humane Letters degree. L. Anderson Daub, senior partner of Brown-Daub Automobile Dealerships, will receive an honorary Doctor of Public Service degree. Roger Newton ’72, the founder of Esperion Therapeutics and co-developer of Lipitor, will be awarded an honorary Doctor of Science degree. Marciene S. Mattleman, a distinguished advocate for literacy and public education, will be awarded an honorary Doctor of Public Service degree. 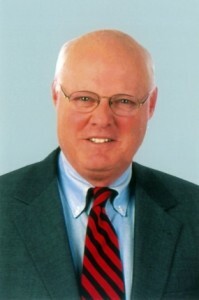 Adams served as president of Colby College in Waterville, Maine, from 2000 until his retirement in 2014. He is a committed advocate of liberal arts education with a long history of leadership in higher education and the humanities. As senior president of the prestigious New England Small College Athletic Conference, Adams has been at the center of the national conversation about the cost and value of liberal arts education. Later, he earned a bachelor’s degree in philosophy from Colorado College and a doctorate through the History of Consciousness program at University of California, Santa Cruz. He studied in France as a Fulbright Scholar before beginning his career in higher education with appointments to teach political philosophy at Santa Clara University in California and University of North Carolina at Chapel Hill. He later coordinated the Great Works in Western Culture program at Stanford University and served as vice president and secretary of Wesleyan University. 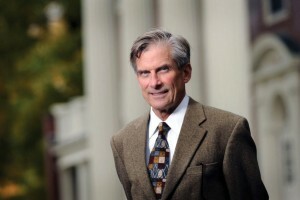 In 1995, he was named president of Bucknell University. In each of his professional roles, Adams brought a deep understanding of and commitment to the humanities as essential to education and civic life. At Colby, for example, he led a $376-million capital campaign ­– the largest in Maine history — that included expansion of the Colby College Museum of Art and the gift of the $100-million Lunder Collection of American Art, the creation of the Center for Arts and Humanities and the cinema studies program, and expansion of the college’s curriculum in creative writing and writing across all disciplines. He also spearheaded a formal collaboration of the college with the Maine Film Center and chaired the Waterville Regional Arts and Community Center. Daub is a respected Lehigh Valley humanitarian and committed public servant. Under Daub’s leadership, the family business has made significant contributions to the community through its support of Lehigh Valley nonprofits, including the United Way, Boys and Girls Club of Easton, and Northampton Historical and Genealogical Society. In 2011, thanks to Brown-Daub’s support, the State Theatre in Easton founded the Brown-Daub Gallery, which exhibits work of local artists. In 2013, Lehigh Valley Business named Brown-Daub Automobile Dealerships Business of the Year and inducted the company into its Hall of Fame in recognition of its charitable efforts in the Lehigh Valley. Daub has been honored for his community service by various organizations, including the Easton Area Community Center. After growing up on College Hill and attending March Elementary School, he earned a bachelor’s degree in economics from the Wharton School of the University of Pennsylvania and served in the Navy. His father and two grandfathers are Lafayette College alumni. 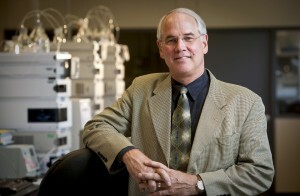 Newton graduated from Lafayette with a degree in biology in 1972. Since then, he has amassed not only a career of cutting-edge biotechnology research, but has championed the discoveries and secured resources to ensure their benefit to the world. Newton co-developed Lipitor, a drug that lowers cholesterol levels, saving millions from heart disease worldwide. Lipitor is one product development in a 30-year career researching the nutritional and pharmacological regulation of cholesterol and lipoprotein metabolism as they relate to atherosclerosis and vascular diseases. Newton’s work has elevated him to an elite position among his peers, at the head of a long list of professional associations. He has co-authored nearly 100 peer-reviewed articles and chapters. An adjunct associate professor in the Department of Pharmacology at University of Michigan Medical School, Newton is also a member of the national advisory boards of the University of Michigan Cardiovascular Center and University of Michigan Life Sciences Institute. He was senior vice president of Pfizer Global R&D and director of Esperion Therapeutics, a unit of Pfizer, Inc. Newton was also president and chief executive officer of the original Esperion, which he founded in July 1998. He earned a doctorate in nutrition from the University of California, Davis, and a master’s degree in nutritional biochemistry from University of Connecticut. He is a member of the board of directors of Juventas Therapeutics, Rubicon Genomics, Ann Arbor Spark, and the Michigan Land Use Institute. Newton also serves on the technology advisory boards of Arboretum Ventures, FirstSense Medical, BioSavita, and the Personalized Lifestyle Medicine Institute. 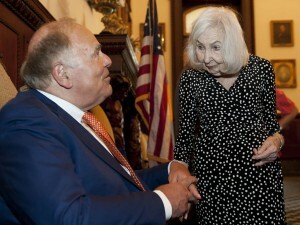 Marciene Mattleman meets with former Philadelphia Mayor Ed Rendell during a ceremony honoring her 50 years of work in education. Photo courtesy of Michael Pronzato, Philadelphia Inquirer. Mattleman is a distinguished advocate for literacy and public education whose work has been recognized at the national level. Mattleman, who launched her career as a sixth-grade teacher and served as professor of English Education at Temple University, founded four nonprofit organizations to support education and literacy in Philadelphia. Mattleman founded and for many years headed Philadelphia Reads and Philadelphia Futures, the latter of which has been replicated in 18 other locations and was honored by President Bill Clinton for providing low-income, first-generation-to-college students with the tools, resources, and opportunities necessary for admission to and success in college. In 1995, President Clinton appointed Mattleman to the advisory board of the National Institute for Literacy, an agency authorized by Congress to work with the secretaries of Labor, Education, and Health and Human Services on matters of adult literacy. She was elected a Distinguished Daughter of Pennsylvania and was appointed to the Pennsylvania Commission for Women by Pa. Governor Ed Rendell. In May 2008, she received the Philadelphia Award, the city’s highest civic honor. Mattleman has authored or co-authored more than 55 articles for professional journals and two books on reading and language activities. Currently, she serves as founder and on the board of directors of ASAP/After School Activities Partnerships, which develops high quality after-school activities and resources to empower youth and strengthen communities in Philadelphia. She also serves on the Mayor’s Commission on Literacy in Philadelphia, which she founded during the administration of Mayor Wilson Goode. Absolutely thrilled to see my old friend, classmate and brother Roger Newton honored. “Newt” was always an enthusiastic optimist who lived the power of positive thinking. It never surprised me that he achieved great success; he earned and deserved it. “High!, high!, high!” to a truly first-class guy!